When it comes to explaining fundamental economic principles by drawing on current economic issues and events, there are no authors more effective than Nobel laureate and New York Times columnist Paul Krugman and co-author, Robin Wells. 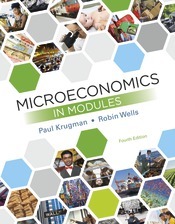 Here, Krugman and Wells’ signature storytelling style and uncanny eye for revealing examples come together in an accessible, modular format to help readers understand how economic concepts play out in our world. Instead of having chapters of traditional length, this version covers the core concepts of economics in a series of brief modules, each focused on one topic and designed to assigned in any order and read comfortably in one sitting. This new edition is more accessible than ever and includes SaplingPlus, a complete, integrated online learning system that supports students and instructors at every stage of learning—pre-class, in-class, and post-class.